Update: Johns Hopkins University Applied Physics Laboratory Mission Control confirmed that MESSENGER impacted Mercury’s surface at 3:26 p.m. Eastern time on 30 April, after relaying its very last image. Mercury is about to get a new impact crater. Around 3:30 p.m. Eastern time today, NASA’s Mercury Surface, Space Environment, Geochemistry, and Ranging (MESSENGER) space probe will run out of fuel and crash-land into Mercury’s surface at a speed of more than 14,000 kilometers per hour, leaving a crater as big as a basketball court. MESSENGER dutifully orbited Mercury for 4 years, showing scientists a world that they had never before witnessed at close range. Launched on 3 August 2004, the spacecraft first whirled around the inner solar system for 7 years, flying by Earth and Venus and three times by Mercury before settling into Mercury’s orbit on 18 March 2011. 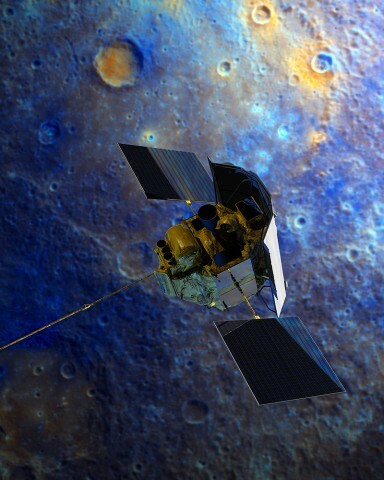 Because of MESSENGER, scientists have made huge discoveries about Mercury. For example, despite surface temperatures that can exceed 400°C, Mercury hosts water ice within deep polar craters that are permanently shielded from the Sun. This finding forces scientists to rethink how the solar system evolved to bring volatiles to the inner planets. MESSENGER also discovered coatings of organic-rich material on some of the ice within these craters, a finding that excited astrobiologists everywhere. Also thanks to MESSENGER, scientists now know that heat loss from Mercury has caused the planet to contract faster than they thought, that Mercury has a weird, tilted magnetosphere that they cannot yet explain, and that volcanic eruptions shaped the planet’s pockmarked surface. MESSENGER’s data have given scientists a deeper insight into not only planetary formation itself but also the formation of our own rocky neighborhood. What else has MESSENGER learned and accomplished? Here are five additional insights and achievements that would not have been possible without NASA’s first dedicated spacecraft to orbit the planet closest to the Sun. 1. Meteor showers on Mercury create a calcium haze. Mercury’s atmosphere—called an exosphere—is fragile and constantly in flux. In 2014 MESSENGER scientists proposed a reason for a particular periodic spike in exospheric calcium: meteor showers. As Mercury passes through a graveyard full of cometary remains, it gets peppered with tiny meteors that vaporize its surface. On Earth, what most people know as meteor showers are actually fragments of comets burning up in the atmosphere as their orbits intersect with Earth’s. Because Mercury does not have the same dense atmosphere to catch the falling fragments as comets pass, the meteors hit the surface. As Mercury passes through a graveyard full of cometary remains, it gets peppered with tiny meteors that vaporize the planet’s surface materials, ejecting calcium-bearing molecules into its exosphere. Computer simulations showed scientists that the most likely cometary candidate for these showers was Eckne, the same comet that dazzles earthlings with the Taurid meteor showers in the fall and the Beta Taurids in the summer. 2. Magnetic field lines travel through the planet. On Earth, interactions between solar wind and the planet’s magnetosphere cause electrical currents to flow down magnetic field lines that connect the magnetosphere to the ionosphere. When Mariner 10 coasted by Mercury in the 1970s, it observed similar currents in the planet’s magnetosphere, which astounded scientists because the planet lacks an ionosphere. With MESSENGER, scientists discovered that these magnetic field lines may actually go through Mercury’s resistive surface and reconnect within its hotter, more electrically conductive core. “Not only is this showing us something about the magnetosphere, it’s showing us something about the interior of Mercury that we didn’t expect,” in ways that are still a mystery, Sean Solomon, principal investigator of the MESSENGER mission, said at a press conference at NASA’s headquarters in Washington, D. C.
3. MESSENGER achieves most accurate flyby. Even before it entered Mercury’s orbit, MESSENGER made a splash. On its second slingshot around Mercury on 6 October 2008, the probe set a record for the most accurate flyby of a planet other than Earth. Using a tiny push from sunlight’s pressure, called solar sailing, MESSENGER mission scientists flew the craft within 199.4 kilometers of the planet’s surface, only 0.6 kilometers off their distance goal of 200 kilometers from the planet’s surface. “It’s as if we shot an arrow from New York to a target in Los Angeles, nudged it three times midstream with a soft breath, and arrived within the width of the arrow’s shaft at the target,” said MESSENGER mission design lead Jim McAdams of Johns Hopkins University Applied Physics Laboratory in Laurel, Md., at the time of the announcement. 4. Scientists discover mysterious hollows. In 2011, MESSENGER sent back images of strange depressions ranging from 18 meters to more than a kilometer across and 18 meters to almost 40 meters deep. These features, which scientists termed hollows, appear to be younger than the craters in which they appear. Scientists believe that they could be a result of current geological processes on Mercury. Pinning down what these processes are, however, is a different sort of puzzle. Because the hollows are found within and near craters, scientists believe that they form after extreme heat and intense solar storms degrade surface material recently exposed by impacts. More research is required, however, to fully understand these mysterious formations. 5. Researchers find unexpected volatiles. MESSENGER’s arrival at Mercury changed all thinking about its history as a planet. Although scientists once thought Mercury to be deficient in the explosive substances that fuel the volcanoes of Earth and Mars, it turns out that the planet is full of volatiles, such as molecules containing sulfur and potassium—leading scientists to believe that violent volcanism rocked the planet’s history. During MESSENGER’s initial flybys of Mercury, it detected hints of pyroclastic deposits—material ejected by a particularly explosive eruption. Once MESSENGER began orbiting the planet, new images sent home confirmed these hints, showing fine details of landscapes covered in pyroclastic deposits. 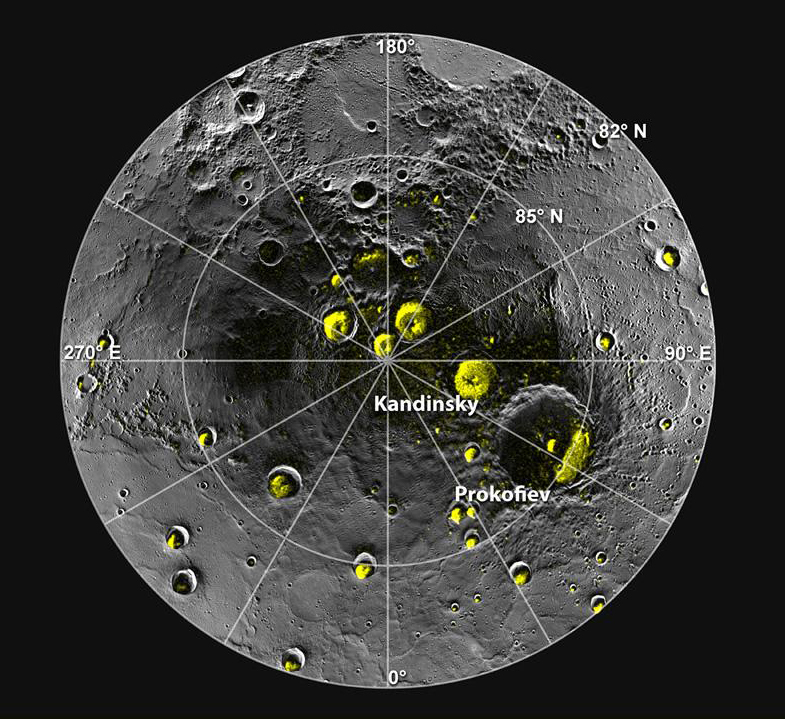 These and other features of Mercury’s surface indicated to scientists that explosions must have occurred over most of the planet’s history. “The legacy of MESSENGER is that, for the first time, we understand Mercury as well as we do the other inner planets, and what we have learned—particularly about the surprisingly large abundances of volatile elements in a planet once predicted to be deficient in such materials—is forcing us to rethink how the inner solar system was formed,” Solomon told Eos. Scientists will not get to witness the crash itself—they will lose contact when MESSENGER passes behind the planet—but they think it will land near the crater Shakespeare. Crash-landing is not all bad, of course. Because of its extremely low altitude leading up to today’s crash, MESSENGER recently sent back its most highly resolved and detailed image of the planet, showing the bumpy surface. To find out more about MESSENGER’s mission and crash-landing, the Slooh Community Observatory is streaming an event starting at 3:00 p.m. Eastern time today. Hosts Eric Edelman and Slooh astronomer Bob Berman will speak with mission experts, including MESSENGER scientist Noam Izenberg, while checking out more images of Mercury. Citation: Wendel, J. (2015), Mercury’s secrets revealed by soon-to-crash spacecraft, Eos, 96, doi:10.1029/2015EO029165. Published on 30 April 2015.